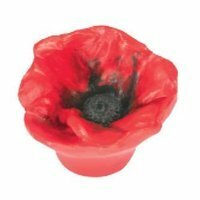 Siro Designs, Red Poppy available at MyKnobs.com everyday low prices. Added these to bathroom vanity to match poppy shower curtain and they look great. Came in perfect condition and appear to be very high quality. This resin product seems to be chip proof. Love them!